Actias selene — “Indian moon moth” | Welcome, visitor! 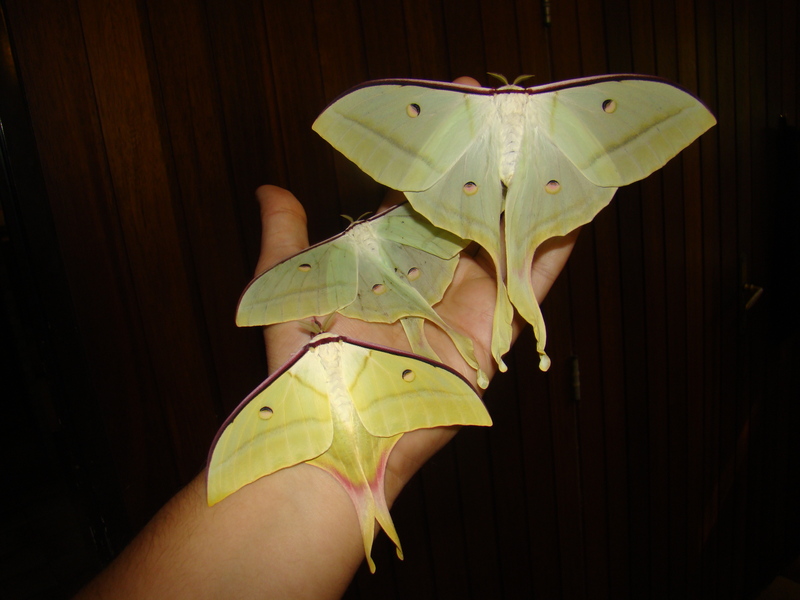 Actias selene, also known as the “Indian moon moth”, is the largest moon moth within the genus Actias. They are of Asian origin and are found in India, Pakistan, Sri Lanka, Myanmar and other places. They are sexually dimorphic – the females are bigger than the males, have a larger wing surface area, and have thin antennae and fat bodies, and generally have rounded wingtips and curves. The males are smaller, have a much brighter colours, have more falcate wingtips and bigger antennae, and have two claspers on the end of their abdomens. Actias selene used to be a species with a very wide range until recently; several of its former subspecies have been elevated to “full” species status. 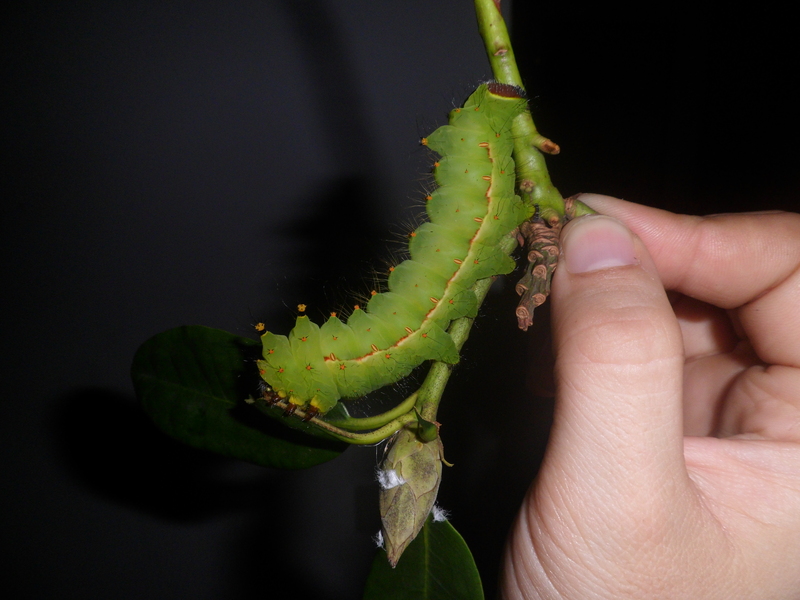 The population in Malaysia for example (Actias selene seitzi) is now a full species (Actias seitzi). Actias selene ningpoana from Taiwan and China is nowadays Actias ningpoana, and so forth. This has decreased the range of is believe to be “true” selene; nowadays, even the populations of “true” selene are divided into subspecies. Actias selene feeds on an enormous amount of plants; Prunus (cherries), willows (Salix), mallow (Hibiscus), hazel (Corylus), amber tree (Liquidambar styraciflua), oaks (Quercus), sumac (Rhus), hawthorn (Crataegus) are all accepted. Host plants: Liquidambar, Alnus Prunus, Rhododendron, Quercus, Crataegus, Malus, Pyrus, Rhus, Salix, Juglans, Hibiscus, among many other things! Actias selene is a moth with quite a large range. Notable are the different subspecies in captivity that differ in appearance, size and host plants. This species has a wide range of known host plants – most notably Liquidambar, Alnus Prunus, Rhododendron, Quercus, Crataegus, Malus, Pyrus, Rhus, Salix, Juglans, Hibiscus, among many other things. They are easy to breed in captivity, and adults seem relatively eager to pair with eachother. The eggs take about 1 to 1.5 month to develop to mature, cocoon-spinning larvae if fed adequately, depending on the temperature and nutrition of their food plants. Eggs hatch in about 10 tot 15 days time and can be hatched in petri dishes or small containers and do not need special care, although misting them lightly may stimulate hatching. Cocoons take several months to hatch. The time the moths spend in their cocoons seems variable and unpredictable at times. 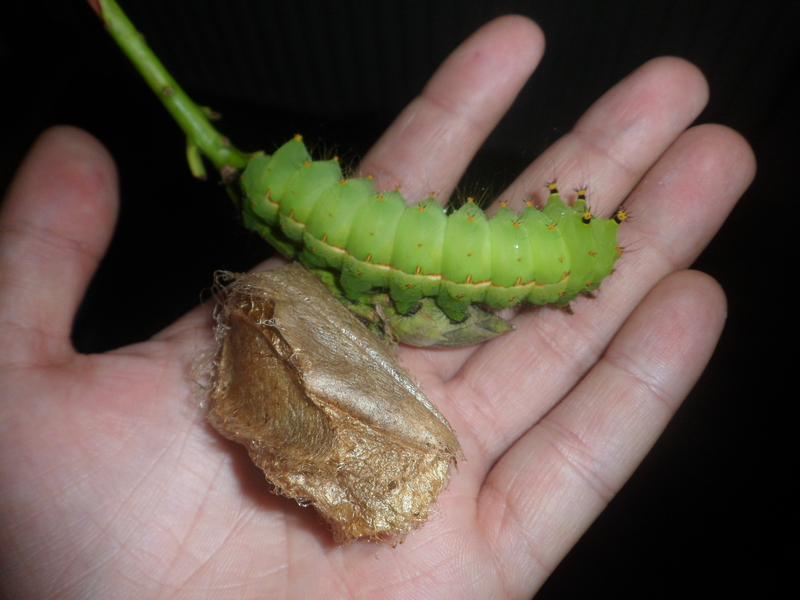 The fastest I have seen them hatch from their cocoons personally was about 1 to 1.5 months after spinning cocoons and pupating. However, in some cases they spend many more months in them (7+ months). Keeping them warm and humid is not required, but it helps to stimulate them to hatch faster. 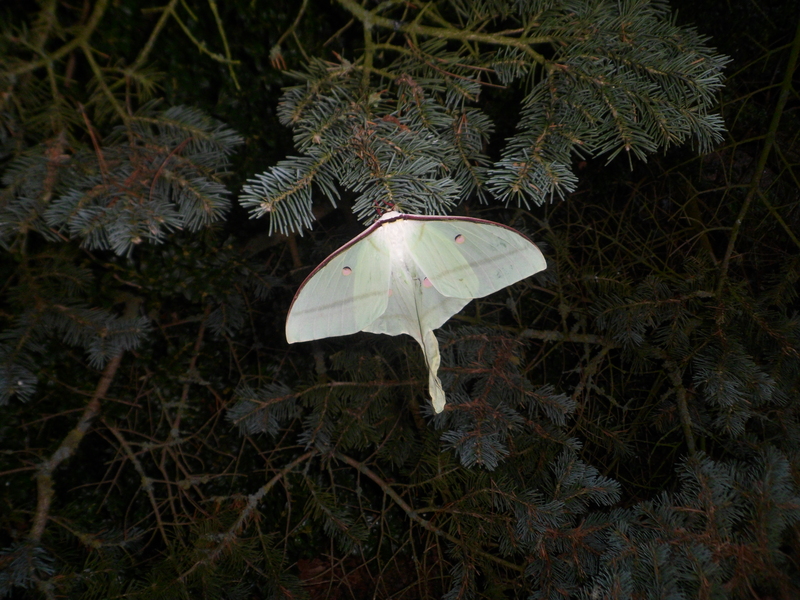 Actias selene is the biggest moth in the genus Actias that contains many kinds of moon moths. 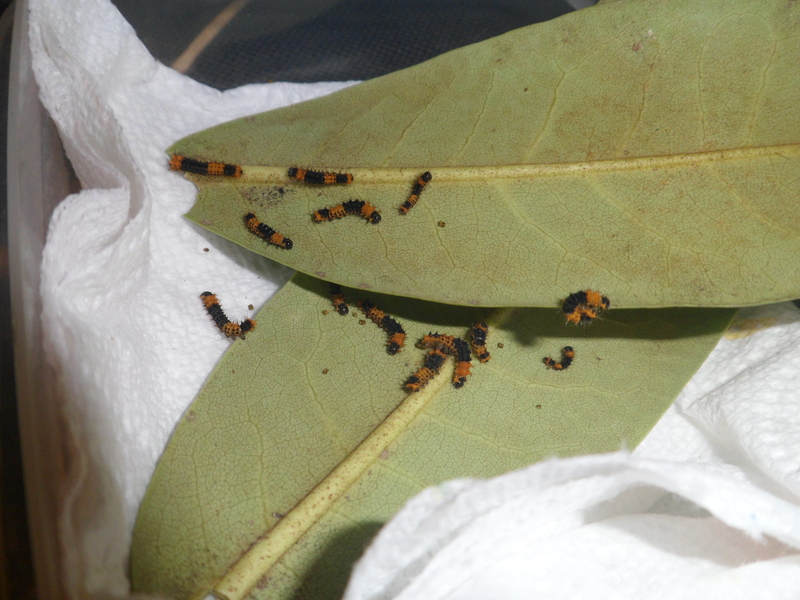 The caterpillars – when born start out as orange caterpillars with a black stripe on their backs. 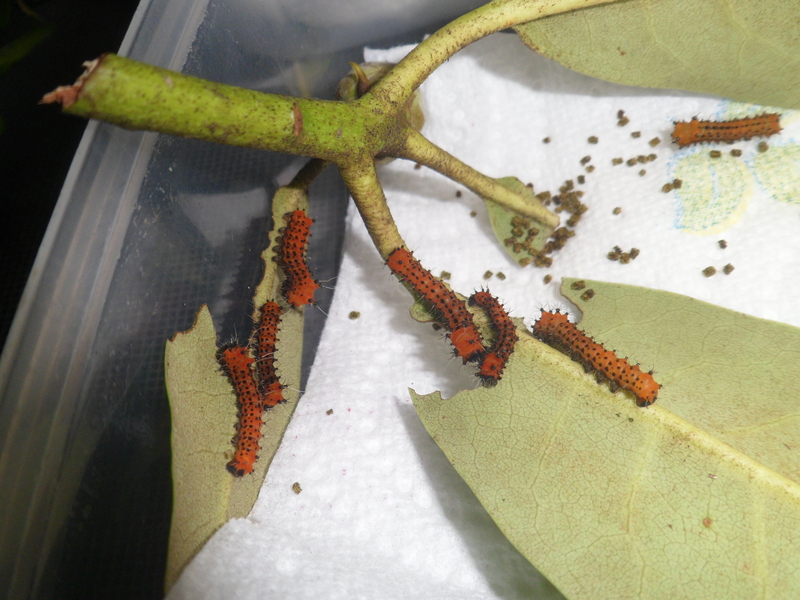 In the second instar they will be completely orange/ red, until they will grow to be green in the final instars (instar 3 to 5). 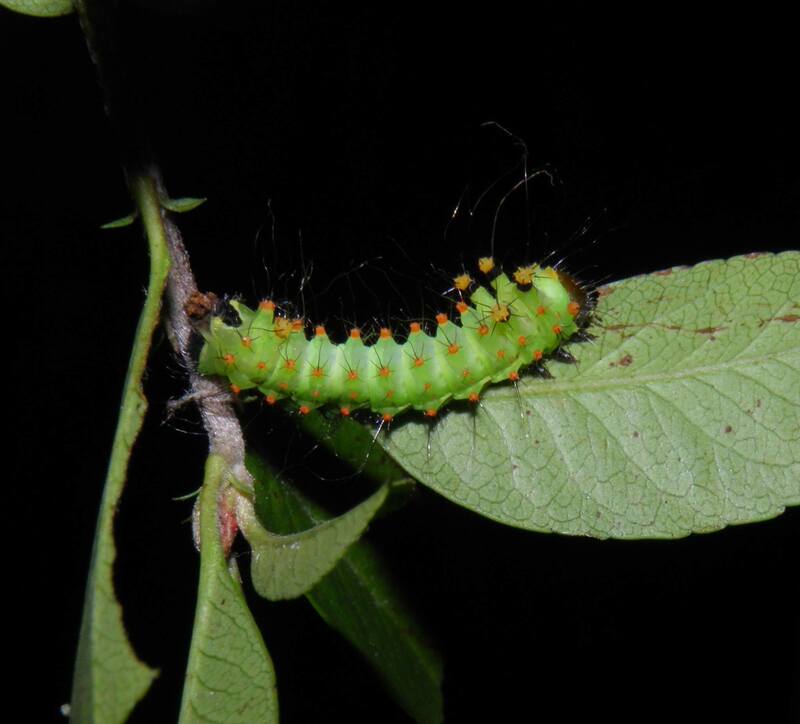 The caterpillars grow quite large and are bright lime-green and decorated with spiky yellow tubercules. The cocoons are quite though and have brown silk. The pupal stage takes about 4 to 5 weeks. Usually there is no diapause, in fact in its natural habitat this species is continuously-brooded with no winter diapause, alhough although they are indeed able to cope with unusually cold conditions by prolonging their development and emergence times if faced with unfavourable conditions. It is however not recommended to keep them cold, and suppressing them for too long may negatively affect their health and development. This species can handle a high humidity, and can cope with being reared in plastic boxes up until the third and fourth instars. However it is not advised to do this as most large Saturniidae caterpillars cope better in a well-ventilated environment; it is recommended to rear them in aerariums/net cages, or replace the lid of their containers with a mesh or netting to allow airflow. Overcrowding and too high humidity will create infections and cause them to die; however A. selene is generally resistent to a higher degree of humidity than non-tropical Saturniidae. From the third instar and beyond the larvae will be green and look similar up until the final stage, only increasing in size each time. Final instar larvae will be long and fat; appearance of larvae varies based on geographical location and subspecies. The setae vary from yellow to orange to pink; their bodies vary in degree of hairiness, some subspecies have notably more hair on their prolegs, underside of the body and space between their setae while others are more “naked” looking. It is best not to keep too many larvae in the same container, as this may promote diseases and infections. 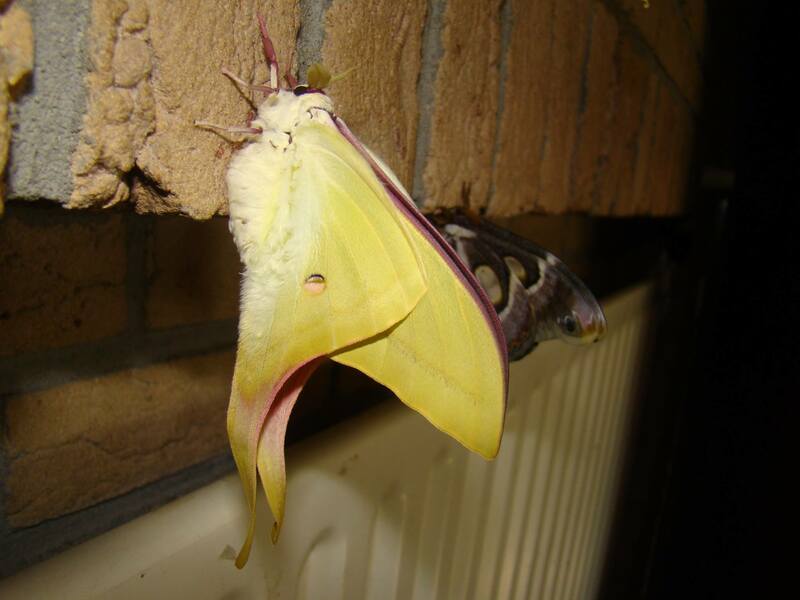 Adult moths do not feed and live for about 10 to 17 days. They will pair if placed in “aerariums” or netted cages. Room temperature is fine for them although these large moths prefer some ventilation for their pheromones to disperse and not fill the entire cage. However, it also seems that in some cases the moths refuse to pair for any clear reason. In this case, it can be likely that the livestock is from a related bloodline; they do not like pairing with brothers and sisters too much. Although first generations will actually pair with brothers and sisters, each generation will stop being attracted to eachother exponentially, as their pheromones start to smell to similar, reaching a point where no moths will pair anymore. It may also be that the room lacks ventilation and that the male has trouble locating the female if her scent has filled up the entire room. Males are active at night; females hardly move at all if not paired and prefer to sit still and disperse pheromones (“calling” the males). When paired and fertilised, females will become slightly more active and restless, and will start to lay their eggs, usually by sticking them to surfaces randomly, scattering them all over the breeding cages. They do prefer to lay them on rougher surfaces. Eggs can be incubated in petri dishes or plastic containers. Okay, it may look weird to see them on the floor of their cage, but I did not even bother to put the food plant in a water bottle, as the larvae ate most of it every day anyways, and I was throwing unlimited fresh leaf at them. Actias selene or Actias ningpoana? Actias selene and several of its subspecies can be difficult to distinguish. This gets worse in captivity, as some breeders and traders have no clue about the origin of the insects they are breeding and identify them based on their appearance only. Here we see some characteristics of the most commonly known species in this group of moon moths. Most commonly misidentified are Actias selene and Actias ningpoana. The “true” Actias selene is believed to have pink eyespots on the wings, and a lot of pink surface area on the tails of the hindwings. Different geographical locations. Actias ningpoana is from Taiwan and China; while Actias selene comes from India, Pakistan, Sri Lanka, Myanmar, Afghanistan, Nepal, Bhutan, Thailand, Vietnam and a small part of China. Mistakes were made. Literature mixes up selene and ningpoana; they used to be the same species before they were split. 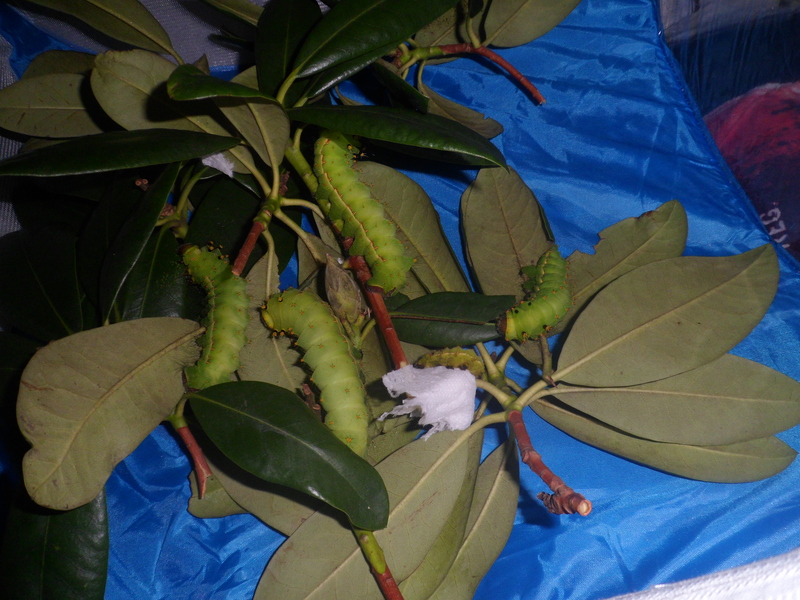 Ningpoana used to be a subspecies of selene; Actias selene ningpoana. Nowadays, people still identify them based on old books, literature, labeled specimens and records. Thus a lot of ningpoana end up with the label “selene” instead. Thus it is not unthinkable to find many pictures of selene on social media that are actually ningpoana, but also in books and museums. Some people insist that their ningpoana are selene and that their selene are ningpoana. The exact geographical locations of many of these species is not well defined (except those endemic to one or a few islands only). They may or may not overlap in some places. Hybridised or ‘bastardised’ stock of selene and ningpoana exists in captivity, due to them being highly compatible and very similar, and due to breeders misidentifying them and mistaking them for the same species. However, specimens or livestock from the wild should always be either selene or ningpoana and not hybrids. This is as I understand it as of 2018. In the future, differentiating them will become more difficult as more and more species are being described based on geographical variations, small differences in their DNA only and morphology. Many of the old subspecies are being renamed as completely new species for the better or worse. This information will change over time and may become outdated. Nowadays, some people are still identifying them based on old books, records and labels. A couple of “true” selene; note pink eyespots, pink hindwing tails. 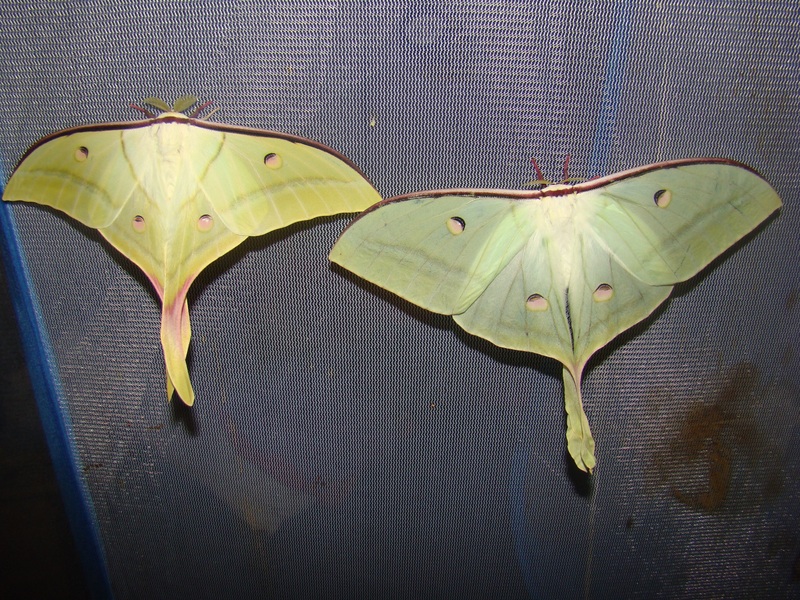 Some people still argue that this is not a real definiting trait of selene and ningpoana; but if I look up records of moon moths from countries where selene or ningpoana respectively live, it seems to match up. For me, this is a reliable trait; although I speculate there can of course be overlapping variation in generally rare cases. I am unsure if they hybridise anywhere in the wild (I don’t think so). 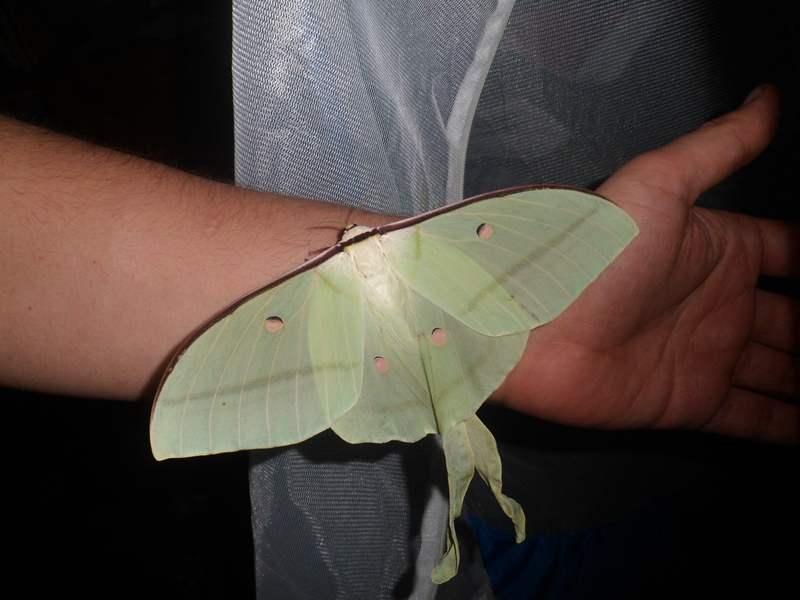 A gigantic female of Actias selene, the biggest I have seen so far in captivity. I estimate her wingspan to be around 240mm, although I have not done an official measurement and could be off by a few centimetres. They have to potential to be very big however.